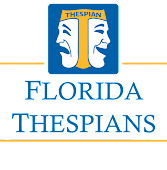 Individual Events in District V follow the rules set forth by Florida State Thespians. All individual events follow the General Rules as well as specific event rules. The time limit for all technical events is 10 minutes. All events on this page must choose from the selected Technical Titles selected by the State Board for competition this year. Extraneous Events do NOT count against the student's three Individual Event. A student may not have more than 6 total individual events. Extraneous Events that are only AT Districts. Student Directors are not allowed to use musicals for their scene work. Want to know what shows were selected in the past? Check out the Tech Title Archive.